Barlow had been one of the best scoring teams throughout the 2017 regular season. But on Saturday night, the Bruins could not capitalize on several opportunities and Forest Grove made the most of theirs, beating the Mt. Hood Conference champs in the OSAA 6A State Soccer Playoffs and advancing to the second round. "I felt really good about this game," said Forest Grove head coach Nacho Olvera. "I thought that if we could keep it scoreless in the first half we were going to be in great shape. In the second half we moved the ball well and created chances to score and Lilly did what she needed to do." 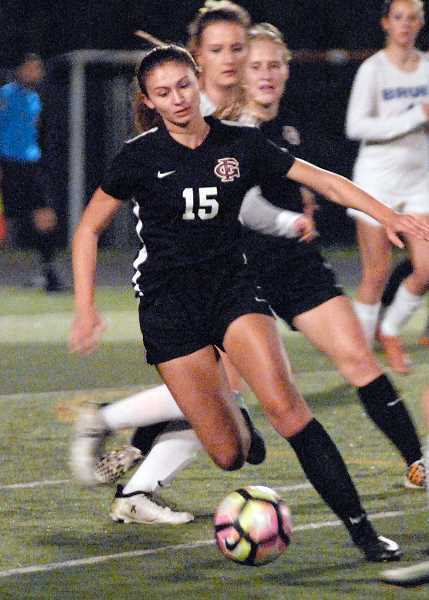 Forward Lilly McGee scored the only goal of the game in the 68th minute as Forest Grove eliminated the Bruins by a score of 1-0. Barlow head coach Jay Jacobson, while disappointed with the loss, appreciated and credited the Vikings for a game well-played. "We had our chances, we just couldn't capitalize…The game could have gone either way," Jacobson said. "You have to give Forest Grove credit, they came in and played really well." Barlow possessed the ball for most of the first half and each time a scoring chance arose, the Vikings were able to turn them away. Midfielder Ally Riggs had the first high-quality look for the Bruins, beating the Forest Grove defense down the field. But her shot at the net sailed wide left. "We still played well. We got most of the 50-50 balls, but in the end we just couldn't finish," Barlow defender Paige Hinkel said. The Bruins would get two more good looks before the end of the half, but both would be stopped by Vikings goaltender Hailey Peterson, keeping the game scoreless. "Barlow came out right away and I told the girls we need to sustain this for the first five minutes and Hailie was great," said Olvera. "Our team has been a second half team for the whole season and we knew if we could keep the game 0-0 in the first half, we would have a really good chance in the second half." Forest Grove proved their coach to be right as they came out for the final 40 minutes. The Vikings came out more aggressive in their attack and starting getting more shots on goal. The Vikings had a golden opportunity to score in the 62nd minute when Britney Perdew had a beautiful cross in the middle to Sophie Davis. The junior knocked the ball a few feet away from the net, but whiffed on her kick-attempt and the ball would be cleared away. Instead of getting their heads down on the missed opportunity, the Vikings took advantage of their very next chance a minute later. McGee received the ball on a throw-in and after a slight scrum for possession, she broke free from the Barlow defense for a brief moment and fired a strike that torched the back of the net from about 35 yards out, putting her team on top. "When I got the throw-in, I went to battle with a couple girls," McGee said. "When (the ball) bounced off, I took it to the middle and just shot it…We felt good about our chance to win once we got the lead." While one side experienced jubilation after the goal, the other side was in sheer disbelief. "If (McGee) takes that shot 10 times, she probably only makes it once," Jacobson said. After the goal by McGee, Forest Grove would drop an extra defender in their back line, which made it extremely difficult for the Bruins to get a good look. 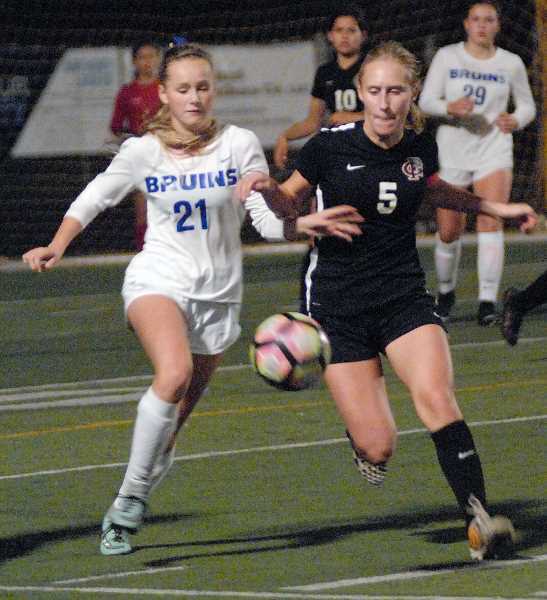 Barlow forward Abi Hoffman got a couple of reasonable chance to tie the score in the last 15 minutes, but the Forest Grove defense continued to shut down the Bruins attack. "(Forest Grove) was playing for the 1-0 win, which I can't really blame them for," Jacobson said. "I probably would have done the same thing. Anything can happen in the playoffs. It's just a different animal." While Jacobsen seemed to lean on chance as the primary contributor for the Vikings win, Olvera pointed more towards the hard work and tenaciousness of his girls, primarily his midfield consisting of Wallner, Yasmin Aguilar, and sophomore Amy Gonzalez, and Peterson in goal. "Jasmine, Maddie and Amy are playing really good in the middle," said the coach. "And I can't say enough about Hailey." Forest Grove will now travel to take on PIL champion and No. 4-ranked Cleveland in the second round on Tuesday at 7 p.m, and while underdogs, Olvera is anxious to see his team in another contest versus a highly rated opponent. "There has been tremendous improvement this year and I like the way we're playing right now," Olvera said. "Were going to give them a battle and a game, and were going to play to win."